Thank you for visiting Motorcycle Garage! We are the premiere fuel injection, Intake and performance specialists. 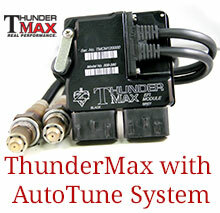 We offer a variety of performance parts and lead the power sports industry in ThunderMax® with Auto Tune. ThunderMax is the industry’s first and only stand-alone Performance EFI Engine Management System developed specifically to meet the tuning needs of both Cable and Throttle-By-Wire Harley-Davidson® motorcycle owners. 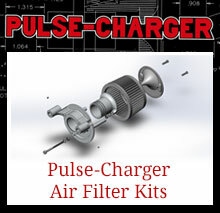 This highly advanced tuning system allows the user to support a wide range of performance upgrades with ease. Our large database of maps allows us to pre-program your EFI controller. We also build custom maps on our CycleDyn high-performance motorcycle chassis dynamometer. Motorcycle Garage customers receive unparalleled product knowledge and service. Owner Bill Miko is a former Harley-Davidson dealer (1975-2006) and Certified Master of Service Technology. Bill has been a trained fuel injection specialist since 1995 and works closely with current manufactures testing new products. 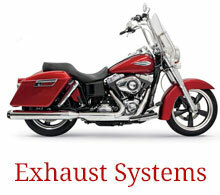 The Motorcycle Garage has a large inventory of exhaust ready to ship from top manufactures. While many exhaust systems look similar we have found through road testing that some just don’t last. Problems we have seen include bad chrome, inadequate ceramic coatings, poor fitment, loose baffles and broken brackets. Some manufactures will even cut cost and provide cheap hardware. The Motorcycle Garage highly recommends Revolution Performance, S&S Cycle, Vance& Hines or American Freedom Performance systems. Call now! Our knowledgeable staff will take the time to answer any questions you might have on any of our products. Call toll free at 1-800-801-0369.